2017 was an exciting year for both residential and commercial renewable energy programs. In April, we launched a brand-new program, Solar Choice, which proved to be very popular. Within the first month of launch, 48 percent of available blocks were purchased - helping underscore the message that our customers want more renewable energy options that meet their unique needs and values. Also in April, PSE launched Green Direct. This program provides large commercial customers, municipalities and government institutions the ability to purchase 100 percent of their energy from a dedicated, local, renewable energy resource, while providing them with a stable, cost efficient solution. The Phase 1 resource offering – a 135 Megawatt (MW) wind project – was sold out by the end of June 2017. Twenty-one customers enrolled. Participants include Target, Starbucks, and REI; as well as numerous local governments including King County, Anacortes, Bellevue, Snoqualmie and Mercer Island. We will open up a new offering for the Green Direct program later this spring. In May 2017, we held an on-the-ground commercial blitz to reach smaller businesses on Bainbridge Island. During that period, PSE’s renewables team visited businesses and discussed the Green Power program face-to-face with owners and managers. In just two days, 13 Bainbridge Island businesses signed up for the Green Power program, bringing the total number of participating businesses on Bainbridge Island to 35. New programs and options were not the only highlights of 2017. It was also an award filled year. PSE’s Green Power program maintained its position as one of the top-5 programs in the nation as ranked by the National Renewable Energy Laboratory’s (NREL) top-10 list for renewable energy participation and sales. Bainbridge Island was awarded the E.P.A. Green Power Community of the year in 2017. This annual award recognizes communities that demonstrate leadership in advancing the nation’s voluntary green power markets. Bainbridge Island government, residents and businesses are currently using more than 16 million kilowatt-hours (kWh) of renewable energy annually, which is enough to meet eight percent of the community’s purchased electricity use. To round out an exciting year of renewable energy momentum, we kicked off our Powerful Partnerships campaign. This campaign provided an opportunity for new Green Power and Solar Choice enrollees to have an even greater impact in their communities. For every new enrollment initiated between October-December 2017, customers selected one of 12 Washington environmental non-profits for PSE to donate to on the customer’s behalf. New Green Power and Solar Choice participants helped raise $27,000 for those Powerful Partners. 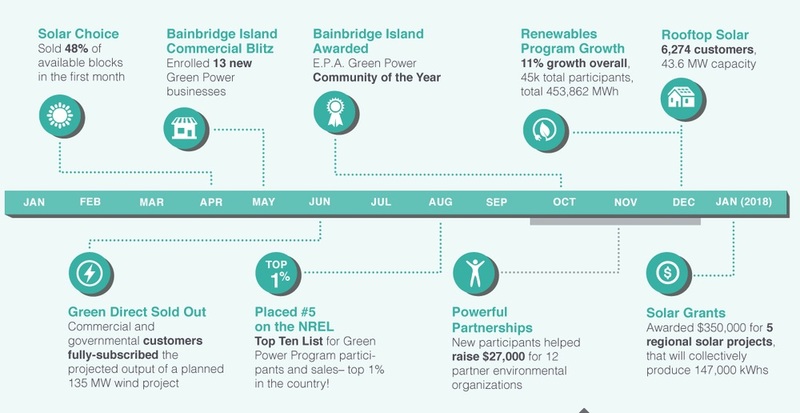 The big take-away from 2017 is that our renewable power programs continued to grow and receive national recognition, thanks to our customers. Participation in Green Power grew by 6 percent, to 44,000; while Solar Choice ended its first year with 2,100 participants. (Bainbridge participation stands at almost 1,200 customers or 11 percent.) That participation supported the generation of 457,213 MWh of renewable energy generation. The Customer Connected Solar program, which allows customers to receive bill credit for excess solar generated onsite and sent back to the grid, reached 6,274 participants (239 on Bainbridge) for a total capacity of 45.3 MWs. 2018 is already off to a great start. PSE kicked off the year with a $350,000 solar grant award for five solar projects in the region, which will collectively produce 147,000 kWhs, annually.